Ubud is a small traditional town, situated in Bali, Indonesia. It is known for its beautiful rice terraces, art workshops and galleries. The architecture in Ubud is incredible and luckily, the town hasn't yet been spoiled by mass tourism. There is a unique and spiritual feel to the place and this is what makes it so special. Ubud’s history goes way back to the 8th-century when Rsi Marhandya , a Javanese Hindu priest arrived in Bali. He meditated at Campuhan, at the confluence of the two Wos River. A shrine was then built and later on was expanded by a Javanese priest called Nirartha, who is known as the founder of Bali’s religious rituals and practices. Around this time, the area was the center of natural healing and medicine. This is where the name Ubud came from, as medicine in ancient Balinese is Ubad. Over the next 400 years, more and more temples and monasteries were established. 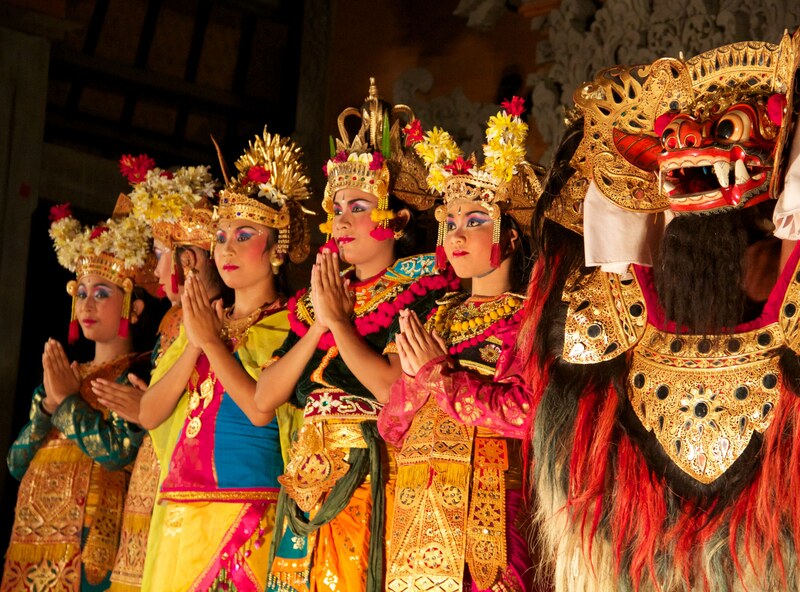 Many of the traditional dances still found in Ubud today were originated from this time. Originally, King Airlangga ruled all of Java and Bali but in 1342, Bali was conquered by the Majapahit Kingdom. In the 16th-century, there was a complete transplantation of the Majapahit Kingdom to Bali because the Islamisation of Java forced them east. 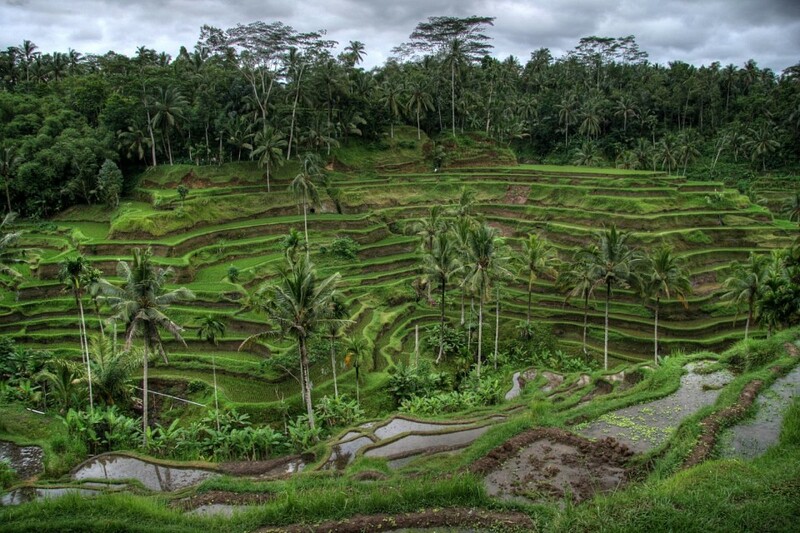 Power changed from various dynasties and feudal lords but Ubud remained extremely important to the island. In the 1900s, the town of Ubud became a Dutch protectorate. The colonists hardly interfered and allowed the traditional arts and culture to remain unchanged. In the 1930s, foreign artists were encouraged to take up presence in the town and from the 1960s, travelers started to arrive although infrastructure was still very limited. Since then, the town of Ubud has rapidly developed into a top class international destination for many people around the world! 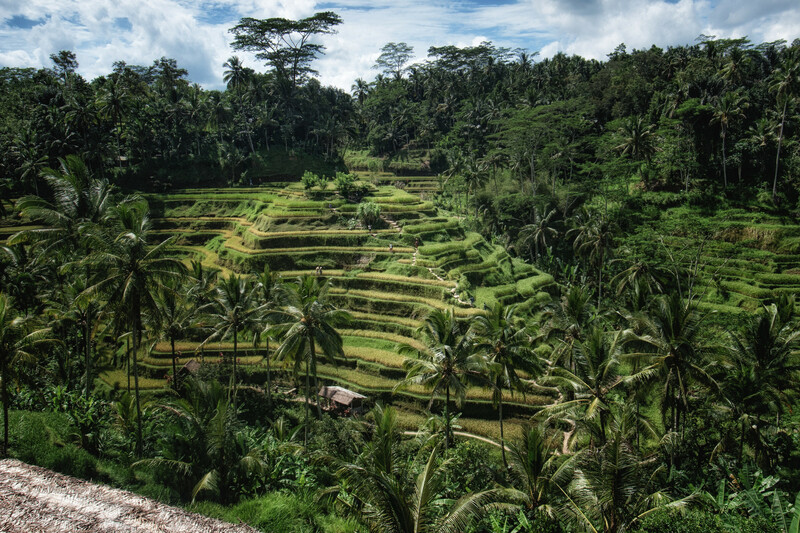 When you first arrive in Ubud, you will instantly notice how beautiful the town is. It is pretty easy to get your bearings as the road goes round in a loop so if you just follow that path you shouldn't get lost. The streets in Ubud are filled with hundreds of unique restaurants, craft shops and massage places. 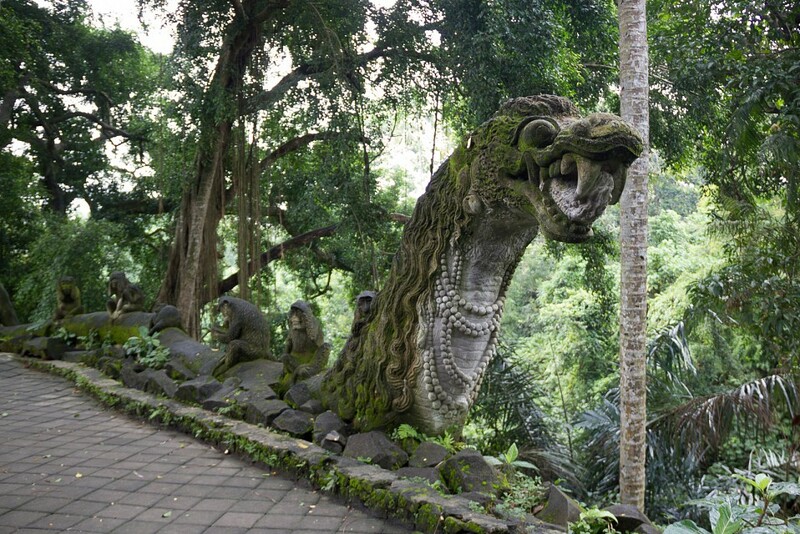 If you take a walk down towards the Monkey Forest, you will begin to notice the monkeys sitting on the walls, walking in the road and climbing down the trees. Ubud is quite a busy town with a lot of cars and motorbikes, but luckily as it is a one way street, you don’t have to worry about looking both ways when crossing the roads. One of the best things to do while in Ubud is to visit the Monkey Forest. 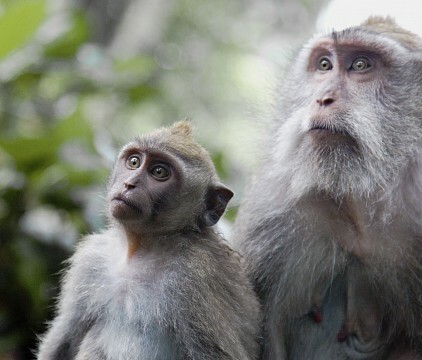 This lush forested area on the edge of town is home to a large number of grey long-tailed macaques, as well as more than 100 species of tree. 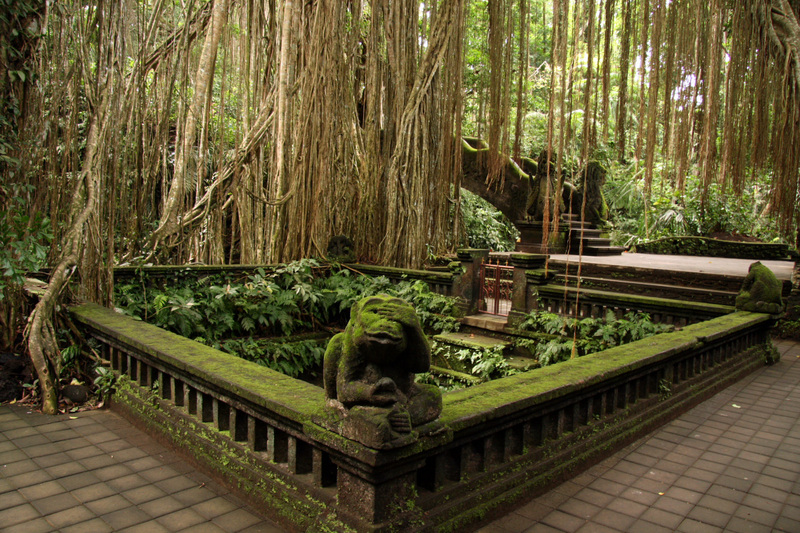 Sacred to the Balinese, the forest is dotted with three Hindu temples which date back to the 14th century. It only costs 14,000 IDR which is around $ 1.20 USD and you get to see hundreds of monkeys at all different ages! It is a great photo opportunity. There are also downhill cycling trips where you cycle throughout the rice terraces and the local villages. The scenery is out of this world; so much color and you get a great feel for how the Balinese people live. Another amazing trip is the white water rafting. This trip is fun for all ages and the rapids are great no matter what time of year you go. Make sure you don’t wear your favorite sandals though, as there is a chance they may go floating down the river! There are plenty of tour agencies in Ubud which offer rafting adventures or go direct to Bali Rafting Tours just a short walk from the palace down Jalan Wenara Wana. Situated in the heart of Ubud and standing prominently on the main street, the Puri Saren Royal Palace dates back to the early 19th Century and is a beautiful display of traditional architecture. During the day you can wander the courtyard and gardens while at night it hosts traditional Balinese dancing with the structure beautifully lit up behind. You will be fascinated by the dancers costumes as they are so colourful and detailed. This nine kilometre walk through the surrounding countryside and rice paddies is one of the most popular ways to experience the beauty on Ubud's doorstep. The trail start is sign-posted just off the main street and descends to the river before heading uphill to the Pura Gunung Lebah temple complex. From here it winds through rice paddies and traditional villages, with plenty of restaurants along the way to rest and refuel at, all under the gaze of Mount Agung. If you are not into participating in trips, Ubud offers lots of amazing temples and architecture in and around the town. The galleries are also great, offering paintings for not much more than $ 2.00 USD (If you are good at bartering). Don't miss the Puri Lukisan art museum in the centre of town which has an extensive collection of traditional Balinese art from throughout history. The exhibits are displayed across a number of buildings within landscaped gardens and it offers an excellent introduction to the evolution of styles. The Blanco Renaissance Museum is another favourite amongst art-lovers, housing the work of late Spanish artist Antonio Blanco who brought his Dali-esque style to Ubud. Also worth visiting is the Neka Art Museum which features art by both local and expat artists, as well as the Agung Rai Museum of Art which is not only a museum but also a culture centre where art classes are available. 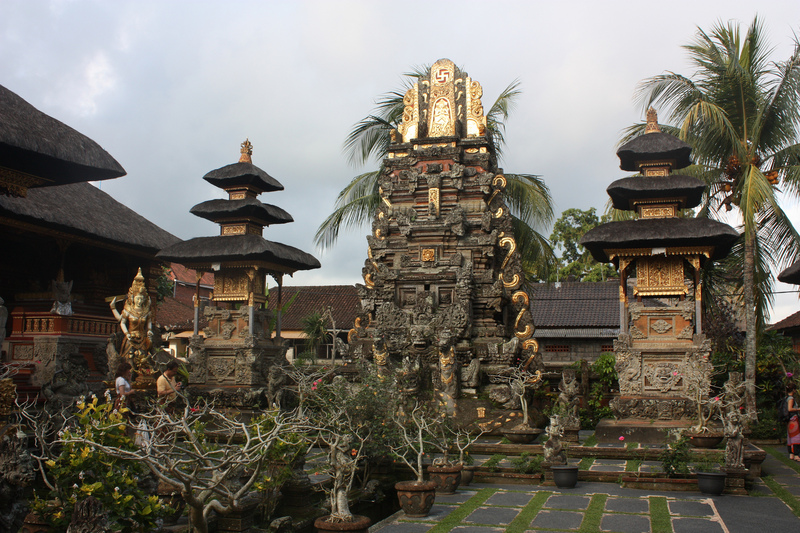 There are plenty of temples to explore in and around Ubud for those interested in the Hindu history of the island. Goa Gajah's Elephant Cave is an archaeological site near Bedulu Village, not far from Ubud. It dates back to the 11th century and is an important spiritual meditation site featuring stone carvings and structure which show both Buddhist and Hindu influences. 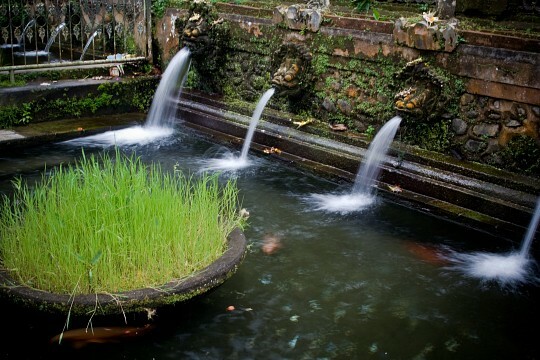 12 miles to the northeast of Ubud lies Tirta Empul, one of Bali's holiest temples built around geothermal hot springs. 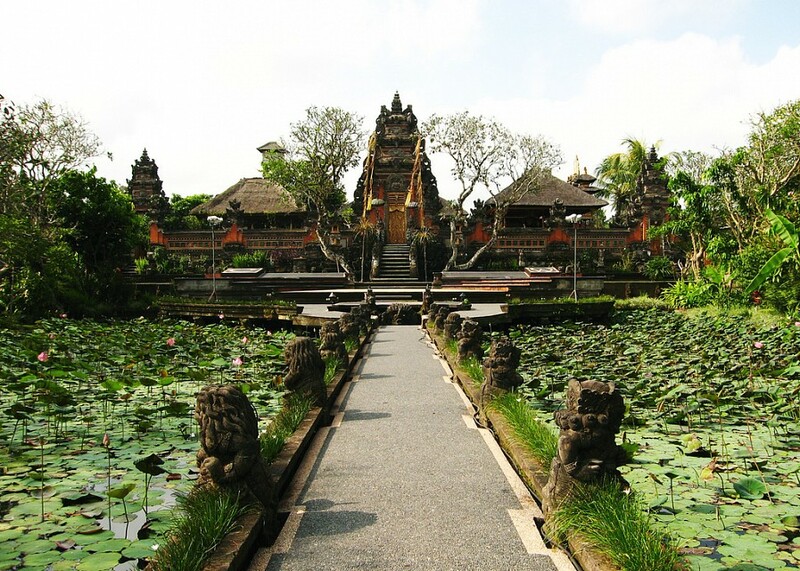 The complex dates back to the 10th century and Balinese and tourists alike come to bathe and purify themselves in the holy water. If you want to bathe, remember to bring clothes to cover up so as not to cause offence. Not far from Tirta Empul is Gunung Kawi, the burial site of King Anak Wungsu. Carved spectacularly into the rock face of a river valley surrounded by lush rice paddies, the setting is magnificent and worth the many stairs you must descend to get there! 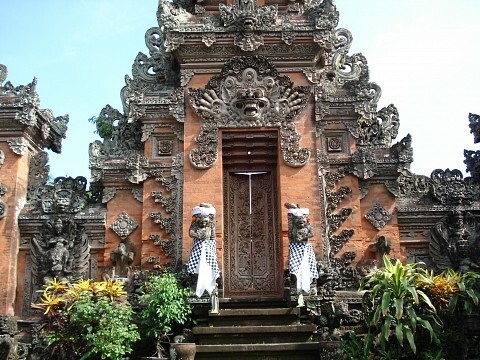 Around 40 minutes drive from Denpasar will take you to one of Bali's most impressive yet little-visited temples, Pura Kehen. Serving as the temple for the Bangli Kingdom, it features eight terraces, elaborately carved statues, and a huge banyan tree believed to be around 700 years old. Ubud's cool climate has made it a centre for alternative therapies with a number of business, both local and expat owned, offering yoga, massage, reiki and body rejuvenation techniques. You can either participate in one-off classes or plenty of longer courses are available, as well as teacher training. There are plenty of places where you can indulge in half or full-day pamper packages which include traditional Balinese massage, skin scrubs and treatments. The prices are very reasonable making this an affordable luxury for most! Ubud is also a fantastic place to take a cooking class or course with plenty of schools offering an in-depth look into this enticing cuisine. You will be educated on ingredients and spices, as well as given hands-on instruction regarding local cooking techniques and methods. A great, practical souvenir to take home with you! Casa Luna offers one of the most established and respected cooking schools with comprehensive courses and market tours. As one of Bali's main tourist centres Ubud is well served by tourist buses from the southern beaches, the east coast and the less developed northern areas. Tour agencies throughout the town sell tickets with fixed prices to popular destinations and the buses pick-up and drop-off right in the centre of town. If you want to travel by public transport than a bemo will be your best option, but be aware that if you are travelling with luggage, space is often restricted. For groups of two or more, taxis are relatively cheap and fixed prices are available to most destinations, including the airport in Denpasar, with some room for haggling. If you are a confident rider, you can hire motorcycles for as little as $ 4.00 USD - $ 5.00 USD per day. Beware though, as the drivers in Bali like to over take and could easily cause you to lose your balance and have an accident if you are not used to riding. The temperature in Ubud is high all year round; reaching up to 31° during the day and with lows of 19° in the evening. The most rainfall is from December to March, which is known as the wet season. This is the time to avoid as when it rains in Ubud, it really does rain! The best time to visit is from May through to August when it is a lot drier but the temperature is slightly cooler, making it more comfortable to walk around. The food in Ubud is incredible and very reasonably priced. There is everything from budget warungs to upmarket fusion dining options, particularly within the five star resorts. The town is home to some great coffee shops for those who need a morning arabica fix, while fresh juices and smoothies are available everywhere. If you are after local Balinese food then you must visit Dayu’s Warung, which is situated on one of the side streets. The food is all made from natural ingredients and the flavors are to die for! If you walk a little way into the surrounding rice paddies there are plenty of restaurants overlooking this green paradise serving up traveller favourites. 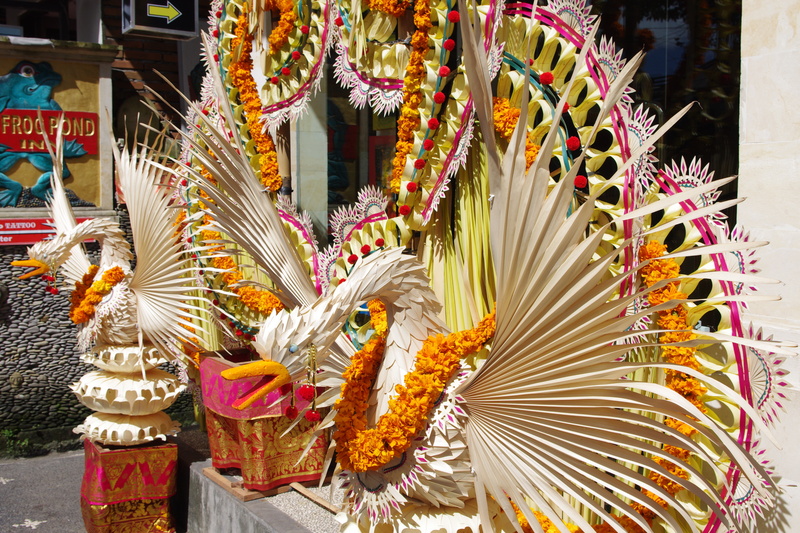 Ubud is a shoppers paradise and, as the home of Balinese handicrafts, there is a huge range of traditionally made arts and crafts. Everything from textiles to carvings to paintings are available and Ubud is a great place to pick up a unique souvenir or one-of-a-kind works of art. The art market is a lively shopping experience and haggling is all part of the fun, while galleries throughout town feature selected local artists. The art museum also features revolving exhibitions with some of the works available for purchase. There is also a huge range of traveller favourites, like carry bags, clothing and trinkets, all for rock bottom prices. Make sure you barter for every good you buy (excluding food), even trips can be bought for a lot cheaper than the original offer price.